The Edmonston Green Street project has transformed Decatur Street, our main residential street, into a fully environmentally responsible street. It utilizes the best sustainability practices from across the country – from the tree canopy overhead to the storm water system underground. It is the first street of its kind in Maryland, and perhaps even on the east coast. All streets have an ‘expiration date’, a time when they must be repaired, resurfaced, or replaced. Instead of fixing our ‘expired’ streets in the conventional way, we fixed it in an environmentally responsible way. By virtue of our town’s location straddling the Anacostia River, and having experienced years of devastating flooding from poor environmental practices, the Mayor, Council, and residents came to quick consensus to do so and build a “Green Street” and we have now accomplished this. In completing this project, we are making a positive contribution to our regional environment, especially to our rivers and the Chesapeake Bay. Virtually all of the pollution that is killing our lakes and rivers comes from storm water, or rain runoff. When it rains, the water picks up pollutants that have collected on parking lots, streets and farms, and moves them into storm drains and tributaries into our rivers. River currents carry much of these pollutants into the Bay, where they then settle and cause destructive imbalances, killing crabs, oysters and other wildlife. We cannot save the Bay without better storm water practices, and green streets are key if we want to fix the pollution problem. Our project alone will not save the Bay, but it is part of the solution. We think that this project is the responsible thing to do. But we also think that if our little working class town can accomplish a project like this, other municipalities – of any size – can and should do them too. New streetlights will use efficient bulbs and ballasts, and will be powered by an alternative source. Most likely, this will be wind energy purchased through an energy provider, though we are also looking at sources such as solar, kinetic and hydrology. 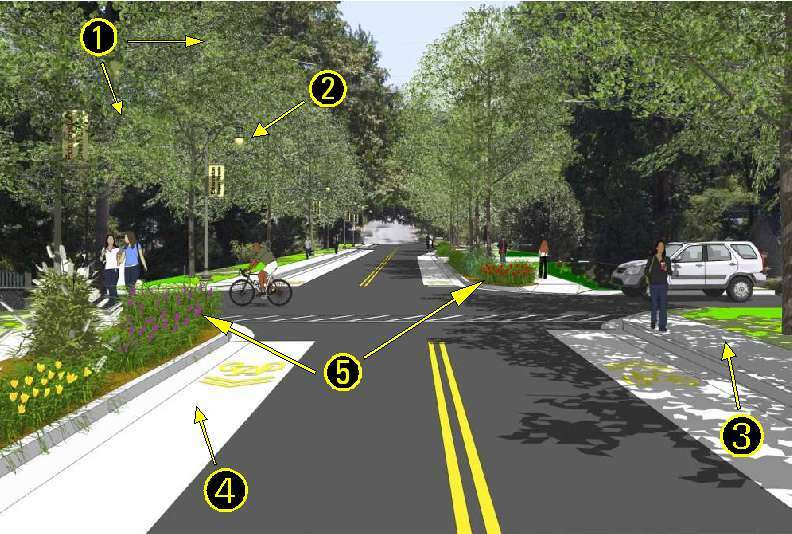 The street and sidewalk will also be as accommodating to walkers, runners and bikers as possible. The street will also be a feature along the Anacostia Hiker/Biker Trail that goes through town, which will soon connect to the National Arboretum, the National Mall and the C&O Canal Trail. The more we use legs and feet to get around, the greener we are. The materials used for the street and sidewalks themselves will consist of as much recycled material as possible, including milled asphalt, concrete and glass. This is the most critical part of our project. Storm water, or rain runoff, will be diverted away from storm drains and the sewer system to specially landscaped areas along the street, which will filter the water naturally through the ground. These bio-retention cells, or rain gardens, will look like regular roadside green space holding trees and plants, but will serve a very important function in the ecosystem. We will also use of permeable pavement (or bricks and concrete that will let water flow through into the ground). In scientific terms, this system will capture the first 1.33 inches of rainfall during a storm, which means about 90% of all rain showers in a typical year will be completely filtered. The raingardens treat 62% of the street, and the permeable pavement of the bike lanes treat an additional 28%. These innovations will keep the Anacostia (as well as the Potomac and Chesapeake Bay) a little bit cleaner. We want the best ideas and an inclusive open process in the development of this project. So, the Mayor and Council enlisted a volunteer “Green Street Advisory Group” of residents, students, engineers, designers, and representatives from environmental and health organizations to generate ideas, review plans, and advise town officials on the project. The group meets monthly and has issued recommendations on horticulture, design, safety, green business development, alternative energy, among other topics. Most suggestions are already incorporated into the project. All plans and phases of the project are on public view at Town Hall. The street will also incorporate a “walking tour” of interpretative signs that describe the environmental features of the street to educate residents, students, and the public. We also plan to make all of the engineering plans and design concepts “open source”, available online, so others can utilize, replicate and improve upon the ideas in our project. Our hope is that green streets soon become commonplace. Refer to numbers in images above. 1. Tree Canopy Non-native and low growth trees reduce habitat and contribute to "urban heat island" effect. Native large canopy trees increase habitat, clean air, and cool street, sidewalks and homes. 2. Street Lighting Sodium and mercury vapor street lights are inefficient, powered by dirty coal energy that emits carbon into the atmosphere. Lights are also located above the trees, which results in less light reaching the sidewalk. Light emitting diode (L.E.D.) streetlight fixtures are extremely efficient, and will be powered by clean wind energy. The lights will be closer to the street to maintain effectiveness to public safety. 3. Walkability / Accessability Broken and narrow sidewalks limit access for disabled persons and strollers, and may violate the Americans with Disabilities Act. (ADA) ADA compliant (36" wide) sidewalks promote wellness, walking and community. 4. Bike Access Lack of dedicated bike lanes reduce safety, discourage bike use and promote cars as the only way to get around on wheels. 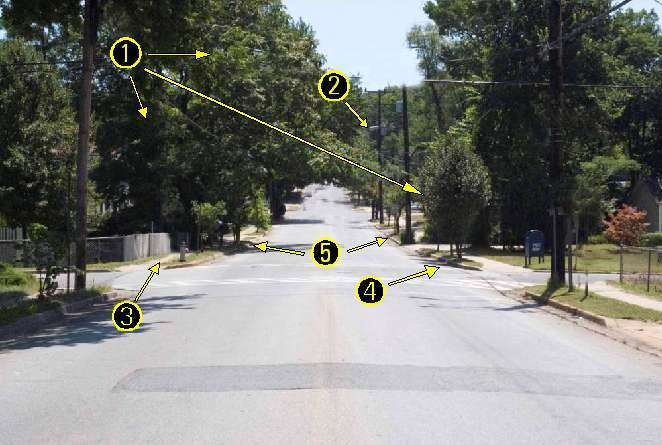 The wide street promotes speeding, making it even less safe for bikes and pedestrians. Clearly marked bike lanes promote safety, wellness, an alternative to cars, and offer connectivity to bike trails and transit. 5. Storm Water The storm water drains debris and pollutants directly into local rivers through the underground sewer system. This poisons fish and other wildlife, promotes illness among people, and contributes to the death of the Chesapeake Bay. "Bioretention" gardens and tree boxes are the destination for storm water instead of the sewer system. The water is then naturally filtered of pollutants and debris, helping restore our rivers and the Bay. 6. Traffic no bump-out The "bump-out" design produces a "wiggle" in the street, slowing traffic for bike and pedestrian safety.